Blood Cherries is a solo theater piece woven from text, Butoh dance, music and intense visual imagery, written and performed by Dawn Akemi Saito. In Blood Cherries a young woman goes on a fantastical journey into memory and the imagination in an attempt to come to terms with the dying and death of her father. Saito transforms herself throughoutinto her charismatic father, her long suffering mother, her French husband, even a wild horse fracturing in frustration and despairall in an effort to understand her father's spirit and find her place in a world without him. In one of the most dramatic and haunting throughlines of the piece she embodies her Japanese grandmother during the bombing of her village during World War II. "Sabrina's ability as a director is astoundingly multi-faceted. 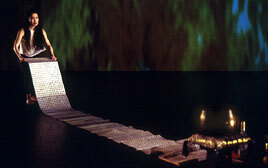 In realizing original work that involves many complex layers of interdisciplinary elements, not only does she have a razor-like focus to sculpt out dramaturgically a clear narrative journey with text, but she is able to stage and weave acting, choreography, music and visual elements together with an exquisite and impeccable sensibility." "Blood Cherries is a solo performance that is fully saturated, deeply moving, and peppered with degrees of humor. The key collaborators in the piece feel truly key to the process of this journey, matching Saito's dynamic shifts point for point with widely imaginative and compelling lighting, striking visuals, and a sound and music score that is often the wave that the text rides." "Impressive... striking... stunning�Saito can make her body express almost any emotion-from her old father's quivering cha-cha to her sensuous rolling on the floor in an agony of sexual longing..."